Charles welcomes customers to his tailoring business. Charles works on a garment that he will later sell. When hit with a tragedy, the idea of moving forward can be daunting. For 62-year-old Charles from Kenya, his wife’s passing meant learning how to function without his life and business partner. Raising 14 children and grandchildren together, including their 13-year-old granddaughter, Lucy, who is sponsored through Unbound in 2011, Charles and his wife knew they had to maintain steady sources of income. 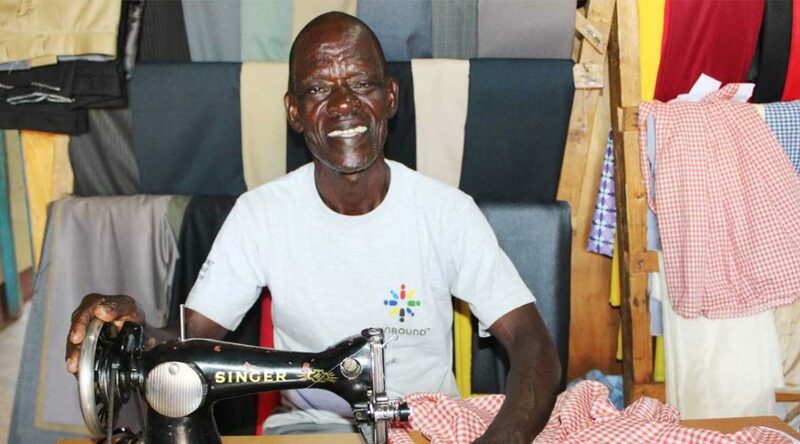 His wife had opened a small tailoring shop, and Charles started working with her after he lost his position as a supervisor in a sugar company nearly 20 years ago. When Charles’ wife passed away four years ago from cancer, his life turned upside down. Through the encouragement of his friends and his faith in God, Charles found the strength to carry on. Because his granddaughter Lucy is sponsored by Joan in New York, he has been able to participate in the local Unbound parent group, of which he is the only male member. He took out a loan from the group to revive his business. Not only was Charles able to rebuild his tailoring business, he also branched out to new ventures. Charles keeps bees as a way to earn income. Charles stresses the importance of education with his children and grandchildren. His son Austine, who was previously sponsored through Unbound, seems to be taking his father’s advice — he graduated from a university with a degree in commerce and human resource management. Charles’ dream is to see all 14 of his children and grandchildren get good educations. Help parents like Charles give better futures to their children. Sponsor today.